The original Kasi Viswanath Temple was ruined by Aurangazeb and he built a mosque in its place. The traces of the old temple can be seen behind the mosque. During the 18th century, the present temple was built by Maharani Ahilya Bai of Indore. It was Maharaja Ranjit Singh of Indore who provided the gold plating on the towers of the temple. The Kashi Vishwanath Temple Banaras consists of a mandapa and a sanctum, besides many subsidiary shrines. The sanctum has a linga made of black stone and is set into the center of the floor in a square silver altar. On the southern entrance of the temple, there are three temples in a row one behind the other, dedicated to Lord Vishnu, Virupakshi Gauri and Avimukta Vinayaka. There are a group of five lingas enclosed in the temple called Nilakantheshvar temple. Shanishchara and Virupaksha temples are seen just above the Avimuka Vinayaka temple. There is another linga called Avimukteshvara which is seen on the right, near the entrance. Some people suggest that original Jyotirlinga at the place is not the Vishwanatha but the Avimukteshvara Jyotirlinga. Well regarded as the most important place of worship in Hindu religion, Kashi Vishwanath Temple is revered by important Hindu saints such as Adi Sankaracharya, Sri Ramakrishna Paramhamsa, Swami Vivekananda, Goswami Tulsidas, Swami Dayananda Saraswati and Gurunanak (Guru Nanak). It is believed that a visit to Kashi Vishwanath Jyotirlinga Temple and a bath in the river Ganga shows the way to Moksha (liberation). Another custom is that one should give up at least one wish, after a pilgrimage to the temple. A visit to the temple at Rameswaram in South India is also included in the pilgrimage. From there, people take the water of Ganga to perform prayer at Kashi and bring back the sand from that temple. Mahashivratri is celebrated in a grand manner at Kashi Vishwanath Temple on the 6th night of the dark Phalgun (February or March) every year. The fasting of Amalakii Ekadasi, conjoined with Dvadasi, comes once in the month of Phalguna (February - March), Amalakii is the descendant of Lord Brahma. Annakoot is celebrated to commemorate the episode in Sri Krishna's childhood. After the prayers, traditional worship and Aarti, numerous varieties of sweets and 56 bhogs would be raised in the form of a mountain before the deity. After consumed by the Lord, the devotees take Prasad from it. Besides, Makar Shakranti, Shrawan Maah and Akshya Trithiya (April - May) are celebrated here. 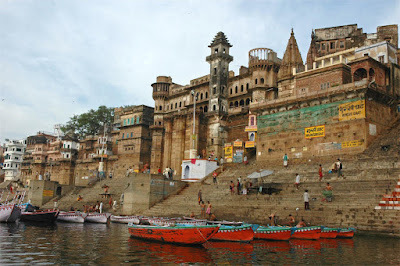 Tourist can take a religious tour to some of the nearby tourist places when visiting Varanasi Kashi Vishwanath Temple. Here are some of the main tourist attractions for people visiting Varanasi. Devotees take a ritual bath in the ghats and perform puja to the rising sun. Notable among them are Varanasi Ganga Ghat, Kedar Ghat, Tulsi Ghat, Mansarovar Ghat, Dasaswamedh Ghat, Panchaganga Ghat, Manikarnika Ghat, Manmandir Ghat, Dandi Ghat and Harishchandra Ghat. Annapurna Bhavani Temple (Goddess Annapurna Temple), Tulsi Manas Temple, Goddess Durga Temple Varanasi, the ancient Kal Bhairava Temple Varanasi, Bharat Mata Temple, Dhundhiraj Ganesh Temple (one of the oldest temples in Varanasi), Chausatthi Devi Temple, Dharmesha Temple on Mira Ghat, Kedareshvara Temple, Mahamrityunjaya Temple (Maha Mrityunjaya Temple), Nepali Temple (Kathwala Temple), New Vishvanatha Temple, Sankat Mochan Mandir, Goddess Shitala Temple, Vakratunda Vinayaka Temple near Rana Mahala Ghat, and Vishalakshi Mandir (one of the holy Shakti Peethas). Babatpur Airport, also known as Varanasi Airport or Lal Bahadur Shastri Airport (IATA - VNS, ICAO - VIBN), is the nearest airport situated just 18 km north-west of Varanasi city. Varanasi lies on the daily air tourist shuttle route linking other major tourist places in India such as Khajuraho, Agra and Delhi. Varanasi Junction Railway Station, also known as Varanasi Cantonment Station, situated at the city center in the cantonment area is a major railway junction managed by Northern Railways. Some of the major trains passing through Varanasi Junction Railway Station include Kashi Vishwanath Express, New Delhi - Varanasi Express, Mahanagari Express, Amritsar - Howrah Express, and Varuna Express. Mughal Sarai Railway Station is another major railway station situated within Varanasi city limits. The holy city of Varanasi lies on NH2 (National Highway) from Calcutta to Delhi and is well connected by road and is easily accessible from all parts of the country. Varanasi is around 128 km from Allahabad, 240 km from Bodhgaya, 286 km from Lucknow and 565 km from Agra. National Highway 7 (NH 7) connects Varanasi with other major cities including Bangalore, Hyderabad, Jabalpur, Nagpur, Madurai, and Kanyakumari. Varanasi being an important tourist destination for both pilgrims as well as other tourists features numerous economic hotels as well as luxury hotels and guest houses. Hotel such as Taj Ganges, Hotel Surabhi International, Hotel Varanasi Ashok, Hotel De Paris, and Hotel M M Continental are all situated within a short distance from Kashi Vishwanath Temple.